City of Bristol completed the Team triple, taking gold in the final event of the ASA National Synchronised Swimming Championships in Gloucester. A fast-paced Free Routine to music from ‘The Lone Ranger’ with original moves and figures, good presence in the water and a high level of difficulty gave City of Bristol their eighth medal of the Championships with a total score of 70.8000. Combined with their Team Tech gold from earlier in the day, Bristol also retained the Redwood trophy for the highest combined score of Team Tech and Free routines. “We knew it was going to be close with Rushmoor but we really wanted to improve on our scores from previous years with that swim,” said Bristol swimmer Emma Holloway. City of Bristol performing their Team Free routine at the 2015 ASA National Synchronised Swimming Championships in Gloucester. City of Leeds performing their Team Free routine at the 2015 ASA National Synchronised Swimming Championships in Gloucester. England performing their Team Free routine at the 2015 ASA National Synchronised Swimming Championships in Gloucester. Rushmoor performing their Team Free routine at the 2015 ASA National Synchronised Swimming Championships in Gloucester. City of Salford performing their Team Free routine at the 2015 ASA National Synchronised Swimming Championships in Gloucester. 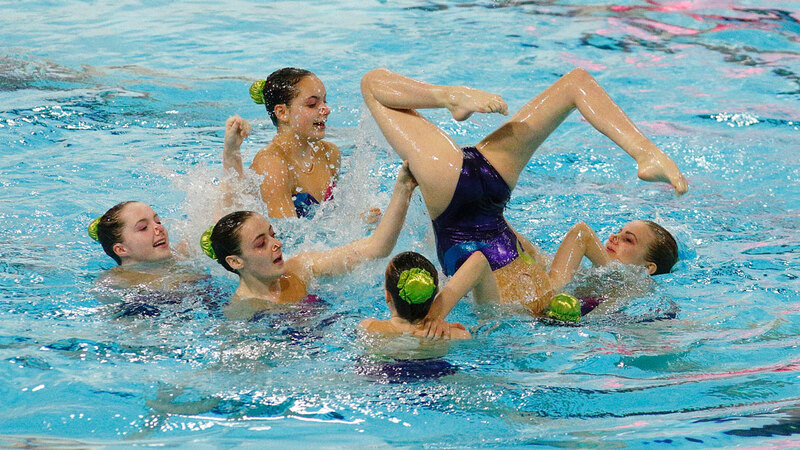 Stockport Metro performing their Team Free routine at the 2015 ASA National Synchronised Swimming Championships in Gloucester. Rushmoor Synchro SC once again pushed Bristol closest to land silver, scoring 67.2667 points for their routine. Swimming to music from the film ‘Hugo’, they delivered a new routine with clever choreography and a good variety of figures. After taking bronze in the Technical event, City of Salford scored 62.4000 to finish third again. The seven swimmers had great energy and good formation during their performance, mixing up the pace and pushing the difficulty level. In the international category, the England Talent squad produced a great version of their ‘Magic’ routine with good synchronisation and lots of energy. Scoring 76.6667 from the judges, it was a good opportunity for the team to perform in front of a crowd as they prepare to compete in the European Games in Baku this summer.